BB, no, not a new cream, it’s beets and burrata, an indulgent combination! Anyhow enough about the pickling, let me tell you about one magical day in a restaurant in Montreal which changed my perception of beets. A friend had mentioned that the best salad on the menu of this restaurant was the beet and goat cheese salad. Well, this was the game changer for me, at that moment I discovered that beets come in wonderfully bright colours other than dark burgundy and that they are actually very flavourful especially when roasted. So, yes roasted beets are quite good served in a salad with goat cheese, as it is often prepared, however you can bring it to another level by serving it with burrata instead of goat cheese. If you haven’t experienced burrata yet, let me introduce you to a whole new world of fresh italian cheese which is just heavenly creamy. In my book, once you go burrata you can’t go back to mozzarella or even mozzarella di bufala. It’s just a better version of mozzarella as the mozzarella is combined with cream in a pouch made of mozzarella. It’s quite indulgent and can be served with fresh tomatoes just as is done with mozzarella di bufala or served with roasted beets as done here. The beets and the vinaigrette for this recipe can both be prepared in advance, up to a day prior to you serving the salad, which makes for a great first course when hosting guests. It is not only bright and colourful but it’s spectacular because of the addition of the oh-so decadent burrata. The roasted hazelnuts are also a must in this salad as they add the necessary crunchy texture to the mix. To make vinaigrette combine vinegar, lemon juice and shallot in a small bowl and stir in mustard. Gradually whisk in oil. Season to taste with salt and pepper. You can cover and chill vinaigrette while the beets are roasting. Toss beets in oil and season with salt and pepper. Transfer beets to a baking dish large enough to fit all beets. I prefer to line the baking dish with aluminum foil as it prevents me from having to clean and scrub the baking dish as the beets will bleed in the baking dish. Then cover baking dish with foil really tightly so steam cannot escape. Cook for about 50 to 60 minutes, until a toothbpick can slide easily through the beets. Carefully uncover the baking dish as the steam is very hot. Let beets cool for about 10 minutes, until you can handle them, then peel beets by using a paper towel to help rub off the peel. This will also help in ensuring you don’t stain your hands. Quarter the beets. In a medium bowl toss beets with ½ of quantity of vinaigrette. Spread burrata on a serving plate and season with salt and pepper. Top burrata with beets and drizzle remaining vinaigrette over the beets and burrata. Garnish with toasted hazelnuts and basil. 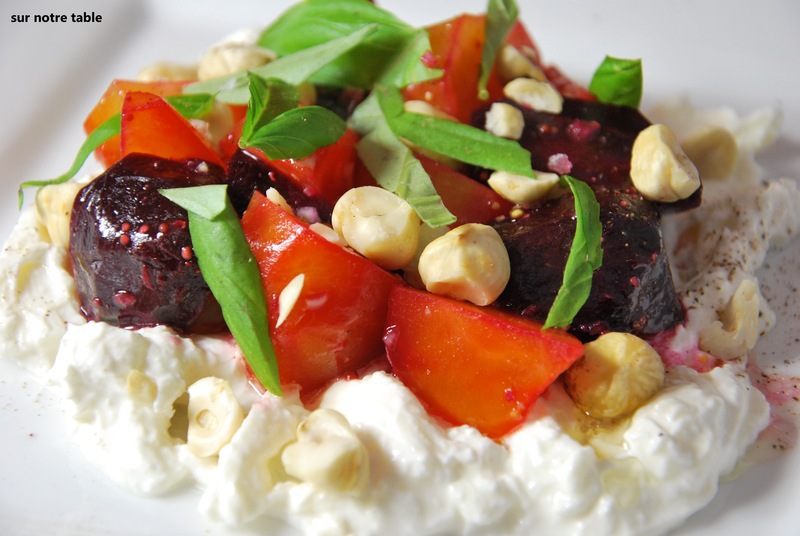 Voila, beets served with heavenly creamy burrata! 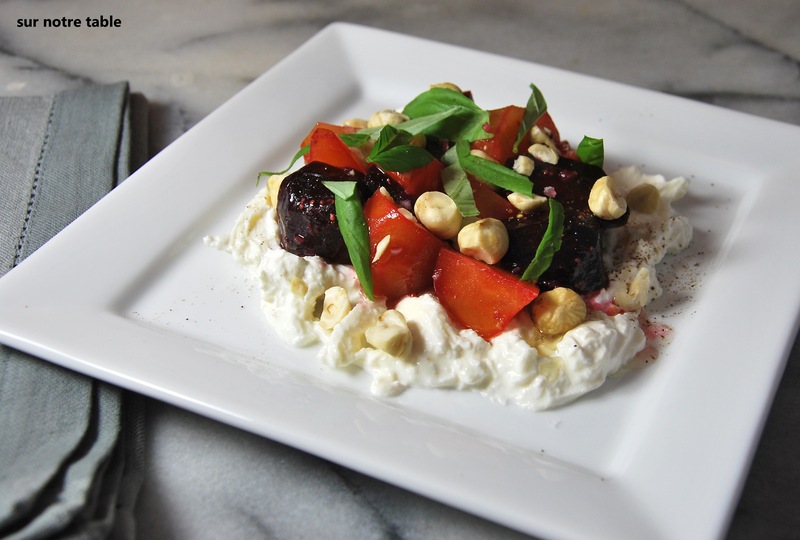 This entry was posted in Appetizer, Easy, Make ahead, salad, Vegetarian and tagged appetizer, beets, burrata, easy, fast, hazelnuts, make ahead, make in advance, mozzarella di bufala, salad by Caroline Reny. Bookmark the permalink.